Please help identify and locate the woman in this photograph. On September 24th she was assaulted by NYPD Deputy Inspector Johnny Cardona in the events that led up to the notorious pepper-spraying incidents of Deputy Inspector Anthony Bologna. 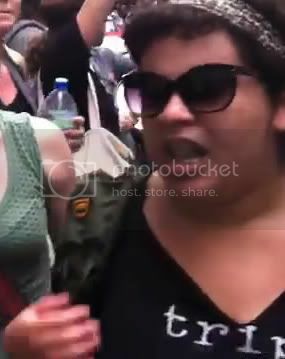 The young woman wearing sunglasses, a band on her head, and a black t-shirt with the word “trip” on the front was singled out by Cardona and violently grabbed by the throat and head while she was standing behind the orange netting in which the police had kettled her. She had done nothing to warrant an arrest let alone the brutal force employed by Cardona in making the arrest. She was grabbed by the throat, then forced to the ground by her hair, and dragged under the orange netting into the street where she was then forcefully arrested by several police officers. It is important to locate her to ensure (1) that she has received appropriate care and is physically and mentally doing well after this violent assault and that she has obtained appropriate legal counsel; (2) that the other victims of Officer Cardona’s brutality, in particular Felix Rivera-Pitre who was violently punched in the middle of the street during a march on Friday October 14th, obtain justice. (Rivera-Pitre is now wanted by the NYPD for arrest in this incident and is in hiding); and (3) that appropriate efforts can be taken to ensure that Officer Cardona is fully held to account for his inappropriate and criminal acts. Please contact me, Charlie Grapski, at cjgrapski@gmail.com or 407-460-7987. All information will remain confidential.